The Commission on Chicago Landmarks has approved a preliminary designation for a dense array of hundreds of late 19th-century vernacular buildings in the heart of Pilsen, a working-class Hispanic community on Chicago’s near southwest side. The district, to be one of the city’s largest, is only a component of a plan seeking to broaden notions of preservation in Chicago, and it aims to protect culture and affordability in Pilsen and neighboring Little Village along with the historic built environment. The Pilsen and Little Village Preservation Strategy is meant to strengthen affordability requirements, provide new housing resources for existing residents, enact an industrial modernization agenda, and improve public and open space. These initiatives are an attempt to steer Pilsen and Little Village away from the type of development that displaces existing residents and threatens the nature of neighborhoods as seen along the 606, a 2.7-mile linear park completed in 2015 that has changed the character of Humboldt Park and neighboring Logan Square, as well as Wicker Park and Bucktown. The measures follow an ordinance in November that cleared the way for Chicago to purchase four miles of an abandoned rail right-of-way currently owned by the Burlington Northern Santa Fe Railway Company for the Paseo, a linear pedestrian and bike trail first proposed in 2006. Unlike the 606, Chicago intends to follow a more careful path forward with the Paseo, taking steps to ensure that park planning will not take precedence over neighborhood-wide concerns of affordability and developer-driven teardowns. The Pilsen Historic District will intersect the Paseo at Sangamon Street, the far east end of the district. According to a report released by Cities, the International Journal of Urban Policy and Planning, monthly rent on tracts bordering the 606 increased by $201 from 2010 to 2016, double the average citywide increase of $102. During that same census period, the share of non-Hispanic whites in the population increased by 4.83 percent. The median household income of people living on property bordering the 606 jumped by $14,682, compared to a citywide $3,557. In addition to taking a proactive approach to new public space, the strategy also responds to pressure from developers looking to capitalize on the neighborhood Forbes named one of the “12 Coolest Neighborhoods around the World” because of its “streets lined with hip galleries and walls decorated with colorful murals dating from the 1970s.” A strong sense of Mexican pride is articulated through the adornment of the built environment with vibrant murals, many using pre-Columbian motifs and portraits of both icons and contemporary activists to express the diasporic identity of the community. These colorful murals are at risk as buildings are bought, sold, and rehabbed, as was the case of the iconic Casa Aztlán mural that was painted over in 2017. A real estate panel targeting developers titled “Chicago’s Emerging Neighborhoods: The Rise of Pilsen, Uptown, Logan Square and Humboldt Park” is scheduled for December 12, and promises to show developers how to reposition assets in “boom” neighborhoods and capitalize on the halo effect of institutional investment. As reported by Block Club Chicago, the event faced criticism on social media, leading to a softening of the tone of the marketing materials and the addition of language addressing affordability. Included in the preservation plan is a five-year Affordable Requirement Ordinance (ARO) pilot program that will increase required affordability requirements for large residential projects that require a zoning change within a 7.2-mile area of Pilsen and Little Village. The bulk of the proposed historic district and the Paseo lies inside the ARO pilot program area. The program will up the affordable housing requirements for new developments with ten or more units from 10 percent to 20 percent, with provisions to increase the number of family size units via financial incentives. Like the citywide ordinance, developers will have to pay an in-lieu fee if they choose not to provide on-site units. Within the pilot program area, the fee jumps from $100,000 to $150,000 per unit. Working in tandem with the ARO pilot, the Chicago Community Land Trust will provide reduced property taxes in exchange for long-term affordability, with the Chicago Low-Income Housing Trust Fund, the recipient of the in-lieu fees, providing rental subsidies. Through a multi-year community-based process, the City of Chicago Department of Planning and Development is looking to modernize the Little Village Industrial Corridor as an employment center while improving economic, environmental, and social conditions. The industrial corridor runs along the Stevenson Expressway roughly from Cicero to Western and provides manufacturing jobs to Little Village residents. Concurrently listed on the National Register of Historic Places, the local historic district designation will protect the physical manifestation of over a century of immigration in Pilsen, a complex patchwork of worker’s cottages, commercial buildings, houses of worship, churches, and schools, most of which were constructed from 1870 to 1910 by Czech and Bohemian immigrants. 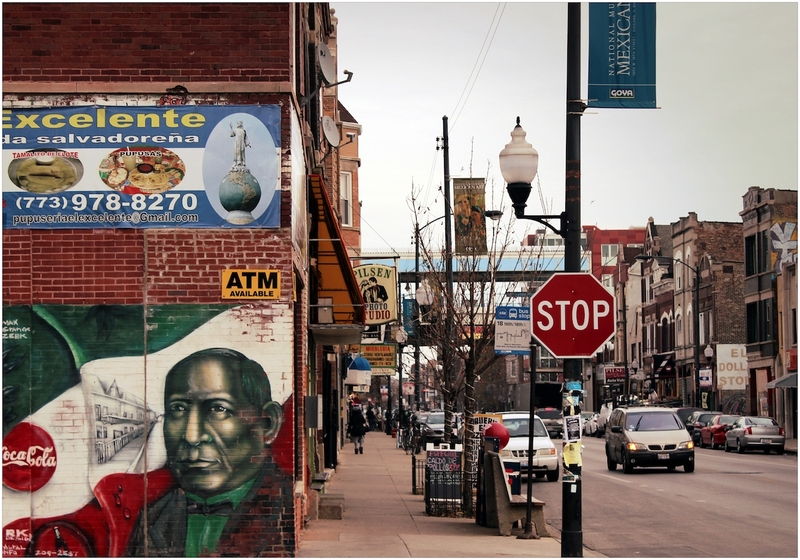 Mexican-Americans became the predominant ethnic group in the mid-20th century, creating a network of ultra-local activism that forged coalitions between working class people across Chicago. Designation of the district unlocks multiple financial incentives for commercial and residential properties, including the 20% Federal Historic Tax Credit and the 25% State Historic Tax Credit, as well as Class L Property Tax Incentives and Preservation Easement Donations.